BOAT OWNER'S NOTES:Fresh bottom paint on hull only 2 years old, The Hull has been professionally sandblasted, barrier coat painted, then 2 coats of bottom paint applied. Please feel free to contact Sherry @ 847-514-7437. 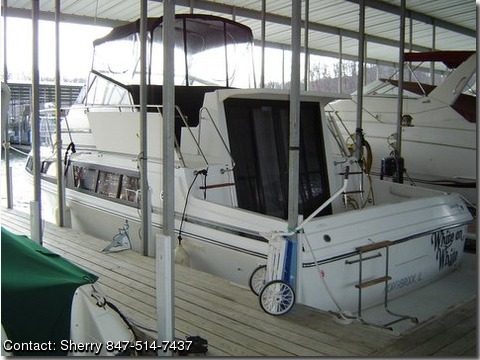 This 1989 Carver Mariner is a great looking, professionally maintained boat with Carver quality. It has Twin 350 Crusaders, 270 HP, with fresh water cooled engines and only 370 hours. It has been one owner loved and cared for. The helm has an Anchor Good Windlass, vhf, Impulse Loran/fishfinder, compass, spot light , Hour Meter, Dual Horns, and synchronizer for gas engines . The fully enclosed cockpit has a bimini top with Eisenglass and zipper windows that open up and remove. 2 Speakers are on the bridge. The bow of this boat has a sun pad area and Bow Pulpit, This boat sleeps 6. There is lots of storage for clothes and kitchen needs. In the salon is a table with u shaped couch for enjoying dining and relaxing. The table lowers down to sleep 2 people. There is another sofa across from the table for conversation which pulls out to make a bed to sleep 2. In the cabin is a water tank monitor, fuel selector valves, Heat/AC, , Battery Charger, Wet bar with bar storage in salon, Stereo CD player.In the kitchen are a 3 Electric burner stove, built in microwave, double sink. The electric panel is conveniently located by the wet bar. The bathroom has a full shower and sink and Crown electric head, power exhaust, cabinet and a medicine cabinet. On the aft is a Fiberglass Swim platform with ladder, Dockside dual electric, shore water.